Today I want to write about one of the most beautiful birds in the world, the Indian peafowl. These large birds grow up to 115 cm long. 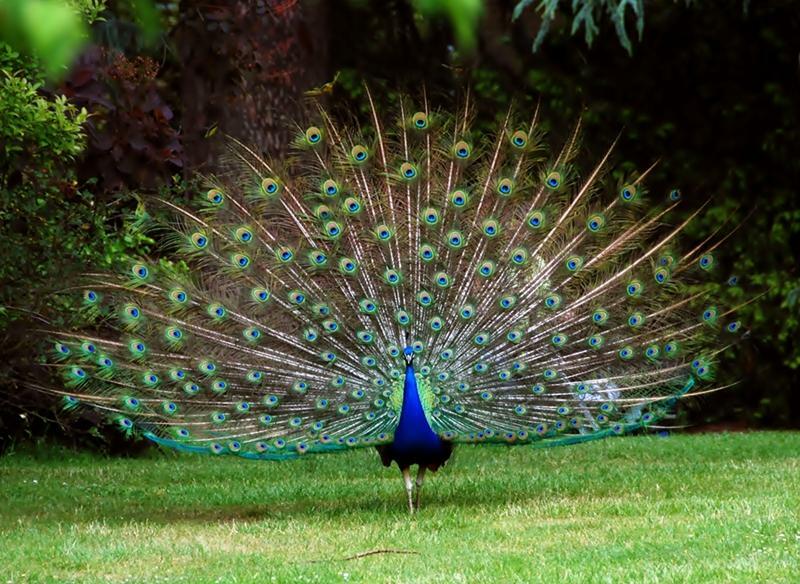 The males (known as peacocks) have a beautiful train of feathers that are a metre long as well. The females are known as peahens and are much plainer looking than the males. The beautiful feathers on the peacock are used to attract peahens for breeding. Females lay between 4-8 eggs and incubate them for about 4 weeks. After the chicks hatch, they are fed by the mother for a few days until they have learned to catch their own food. They spend most of their time on the ground looking for food and are very fast runners, although they can fly when required. They have small territories, which makes them easy to keep as they won’t leave a garden or area once they feel at home and have enough food. Indian peafowl mainly eat seeds, fruit, berries and insects, although they will also eat small mammals and reptiles. They are an abundant species that is native to India (where they are the national bird), Pakistan, Bangladesh, Sri Lanka, Bhutan and Nepal. They have also been introduced to the United States, Australia, South America and parts of Africa. Are there any other interesting facts that you would like to share about Indian peafowl?